JIMS performance parts for Harley Davidson motorcycles. JIMS is one of the industry leaders producing performance parts, accessories, tools, transmissions, and high-performance engines all aimed at enhancing the Harley rider’s experience. JIMS employs skilled craftsmen running an amazing collection of high-tech machines such as CNC machining centers, lathes and inspection equipment, with state of the art design and engineering capabilities, prototype department, and testing facilities to ensure quality is the number one priority. Every design element and every part of JIMS 135" Race Engine has been developed and optimized to produce a balanced, durable and very powerful racing engine. As it stands, unmodified, the JIMS 135" Race Engine delivers 135 ft/lbs torque and 130 Horsepower. It is strong enough to produce much, much more. JIMS has concentrated development on building a solid foundation for further modifications. There is enough case material to support a bore size of 4.800", substantially thicker than a stock Twin Cam. Whether you’re just swapping cams or tackling a complete rebuild, JIMS tools will give you peace of mind Knowing your work is tested before the final assembly is through! In the past 40 years, JIMS has developed over 500 tools for use on Harley-Davidson motorcycles, all designed to let you build with confidence and precision. All JIMS manufactured tools are machined here in the USA and are guaranteed for life. JIMS® Now offers a transmission rebuild service for Harley Davidson® and aftermarket transmissions. This includes your old 5-Speed all the way through the new Cruise Drive! We all know times are tough. For some, that means keeping your "older" motorcycle running good instead of upgrading to a new bike. That's where this new Transmission Rebuild Service from JIMS comes in. You can now send your old, tired transmission into JIMS for a complete overhaul: JIMS will completely disassemble your transmission, inspect all wear surfaces and replace all bearings, and seals*. This is a great option for those who are trying to "maintain" their current bike instead of buying a new transmission or a new motorcycle. 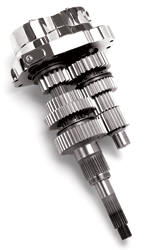 JIMS has built a reputation for manufacturing and assembling quality transmissions, including 5 and 6 speeds, Right Side Drives with bearing support and the JIMS Fat 5™ overdrive. This expertise is now available as an affordable option by industry professionals. JIMS is one of the industry leaders producing performance parts, accessories, tools, transmissions, and high-performance engines all aimed at enhancing the Harley riders experience. JIMS employs skilled craftsmen running an amazing collection of high-tech machines such as CNC machining centers, lathes and inspection equipment, with state of the art design and engineering capabilities, prototype department, and testing facilities to ensure quality is the number one priority.